For more than 130 years, DIOSNA's machines have been representing quality, functionality and robustness. Our L-Shaped Mixers combine these properties in one high-quality housing and provide these and provide you with the best possible dough quality. Designed for the challenging everyday work, they also convince with easy operation and are virtually free from maintenance. Not only for kneading, but also for any other processes in the bakery operation, we are at your disposal as DoughExperts. Founded in Osnabrück in 1885 and still located there today, DIOSNA was granted the first patent for its mixing and kneading machines in 1911. The company grew up to a globally acting enterprise that, in addition to the food industry, also supplies the pharmaceutical industry. Discover our modern solutions and shape the production of the future together with us. For the L-Shaped Mixers DIOSNA is focused on the efficient increase of production and processing in operation and manufacture. Therefore, the machines are equipped with a powerful drive that allows intensive kneading of all types of dough, especially grist, rye and mixed bread doughs benefit from the sophisticated system. The result is a homogeneous mass that is suitable as perfect basis for further processing. At least as important as the result, however is the way to achieve it. Thanks to intuitive operation, easy cleaning and movable bowl with standard interlocking clamping devices, the bakery machines provide for an uncomplicated and efficient bakery process. For the kneading systems you have the choice between the two models D 240 A and S 240 AZ. 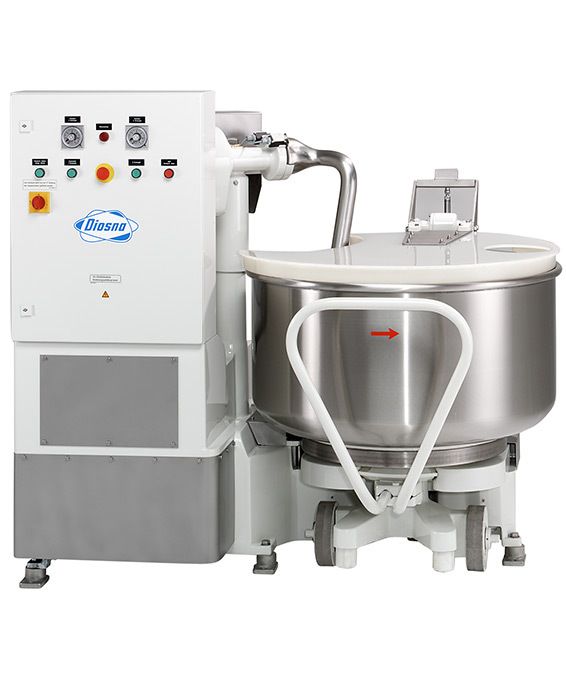 While the key properties like capacity of dough and flour as well as bowl capacity and diameter are identical, the S 240 AZ has an additional bowl and hydraulic drive in addition to its standard tool drive. 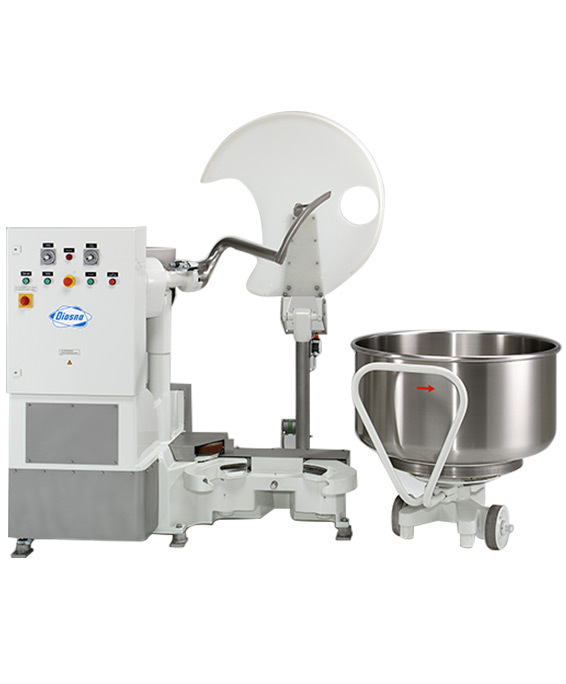 The two models of the L-Shaped Mixer provide a respectable dough capacity of 240 kg, a flour capacity of 150 kg and feature a bowl capacity of 355 litres. On request, an optional program memory with membrane keypad as well as programmable time schedules are available that allow manual intervention in the set-up program at any time. The kneading systems are characterised by their large mixing and kneading area. The mixing arm moves elliptically and in this way, it reliably catches the dough to be processed from the bowl centre to the wall. Furthermore, the bowl cover provides for dust-free and save working. At DIOSNA we know that good kneading is decisive for the quality of the final product. Therefore, we are offering to our customers a wide range of highly developed solutions for all demands and sizes of operations. As an example, convince yourself of our flexible spiral mixers that inspire with numerous innovations from the table model to the Premium design. 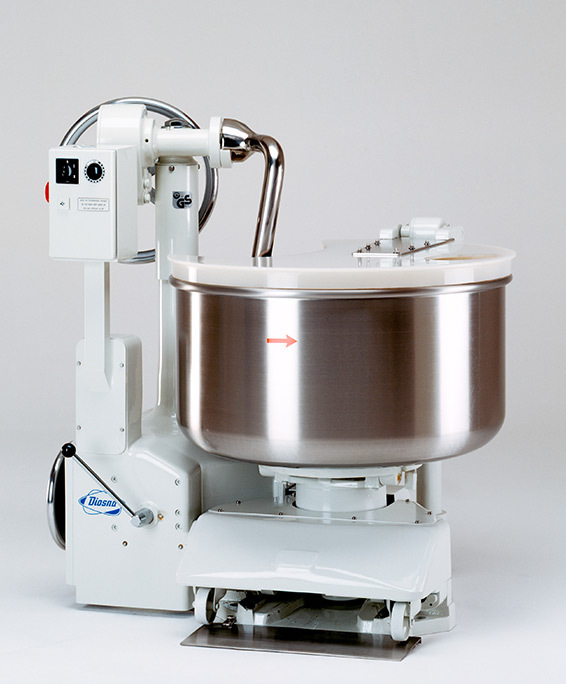 Our Wendel mixers that are able to contain up to 600 kg are fully designed in compliance with industrial standards. If it is about fully-automatic dough production, out systems with carousel principle, central discharge, as well as the continoMIXX plants represent the optimum solution. You see - DIOSNA gives the right answer on your company's individual demands and forms the basis for outstanding kneading results. Certainly, kneading is only a part of your production process - to receive high-quality and competitive final products, it is required to use professional equipment reaching from production of sour dough to the processing of bread leftovers. As DoughExperts we deliver not only first-class bakery machines but also our DIOStart cultures as the best preconditions for exact results. We would be delighted to provide an opportunity to get to know our products before purchase. Visit us in our laboratory and our experts would be pleased to introduce you into the variety of our range of products. It is also possible to develop new products in your company - just make an appointment with us. We are looking forward to welcome you! * For solid doughs less, e.g. pretzel, puff pastry to 80% filling. DIOSNA operates a continuous improvement and further development of its products and therefore reserves the right to make technical changes. Decisive for promised properties, services and the quality of the DIOSNA products is the contractually fixed agreement in the individual case. We will be pleased to send you further information on request. DIOSNA operates a policy of continuous product improvement and development and reserves the right to make technical changes. The specific contractual agreement is always decisive for the properties, capacities and condition promised for the DIOSNA products. We would be delighted to send you further information on request.